Stylish with a rocker twist, this short a-line red homecoming dress is a trendy blend of lace and rhinestones. 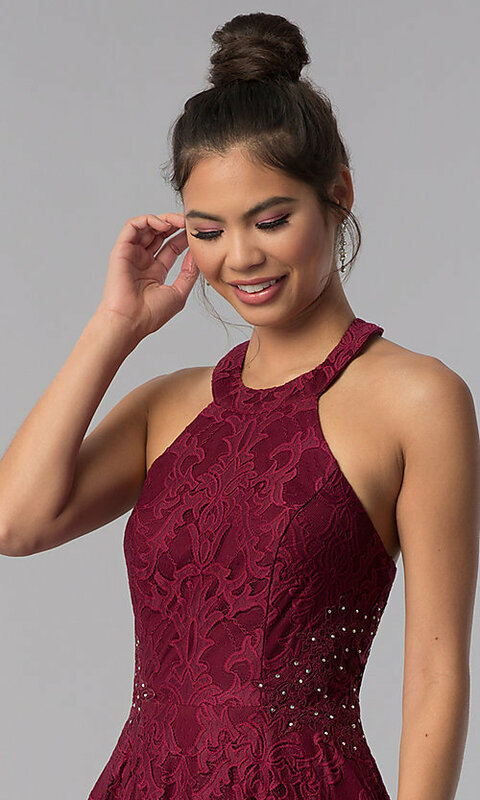 Burgundy vintage-patterned lace decorates the semi-formal party dress for a cool eclectic vibe from the high neckline to the flirty above-the-knee hem. Accentuating the sides, rhinestones embellish the lace to give the short homecoming dress an incomparable flair. A racer front gives this design an equally appealing sporty feel that complements the short length of the full skirt. For definition, seams line the sides of the bodice and surround the natural waist before the a-line skirt extends out over the hips. Making this red lace party dress exciting with every turn, a triangular cut out reveals the back in a daring fashion.